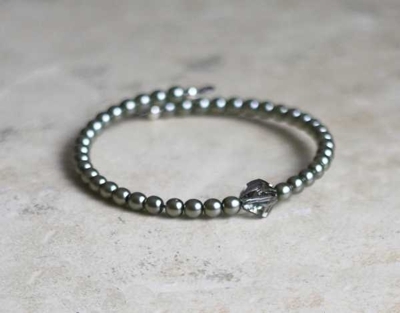 This pale sage green bracelet is simple and modern in design. I’ve made this beaded cuff style bracelet with pale, light sage green glass beads (they are almost gray in colour) a Swarovski Elements Black Diamond crystal accent bead (it’s a lovely smoky gray) and finished with tiny sterling silver beads. This is an all occasion bracelet – wear it to work or a night out on the town. Wear it on its own or stack it up with other bracelets. It’s also a great piece to add a feminine look to your t-shirt and jeans. This bracelet is a coil wire that will hug your wrist and it has a snug fit. It is very easy to put on and take off as there is no clasp to worry about.